Design models must abide by constraints that can come from diverse sources, like metamodels, requirements, or the problem domain. Modelers intent to live by these constraints and thus desire automated mechanism that provide instant feedback on constraint violations. However, typical approaches assume that constraints do not evolve over time, which, unfortunately, is becoming increasingly unrealistic. For example, the co-evolution of metamodels and models requires corresponding constraints to be co-evolved continuously. This demands efficient constraint adaptation mechanisms to ensure that validated constraints are up-to-date. This paper presents an approach based on constraint templates that tackles this evolution scenario by automatically updating constraints. We developed the Cross-Layer Modeler (XLM) approach which relies on incremental consistency-checking. 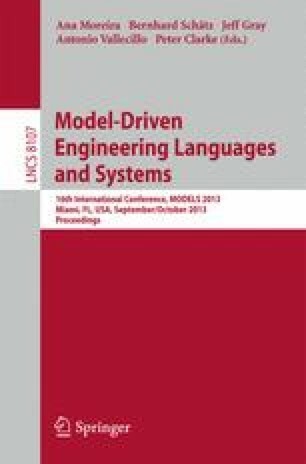 As a case study, we performed evolutions of the UML-metamodel and 21 design models. Our approach is sound and the empirical evaluation shows that it is near instant and scales with increasing model sizes.